If I don't care [for] my environment, who will, asks entrepreneur Olabanke Banjo who believes the possibilities are endless for upcycling old tyres. Banjo quit her job in May because she strongly believes in her passion to turn old, used tyres into artsy and ultra-modern furniture. She tells BBC News she wants to contribute immensely to the reduction of environment pollution caused by among other things the burning of tyres. She sources her tyres from refuse dumps, incinerators, sometime the road side and more often than not she also buys from vulcanises and also people who want to change their old tyres with new ones. 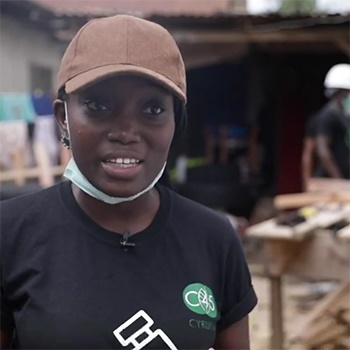 "When other women see what I do they are really inspired to want to do something similar - to go into carpentry and do something that seems as a male dominated thing," she says.